Copperloy has been producing industry-leading aluminum twin lock ramps for more than 60 years. When you need a unique, versatile and convenient solution, you can always depend on Copperloy and our high quality, proudly American made equipment. Light duty ramps offer capacities of 6,000 lbs, while the heavy equipment loading ramps offer a more robust 7,500 lbs capacity. Both options come in three lengths, 10 feet for heights from 20 to 28 inches, 12 feet for heights from 25 to 34 inches, and 14 feet for heights from 29 to 40 inches. 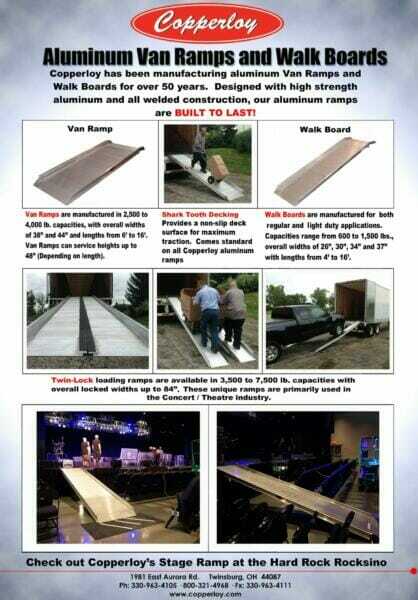 Our split ramps come in both light duty and heavy duty models. Light duty offers a capacity of 6,000 lbs, while heavy duty models raise the capacity to 7,500 lbs. All offer single widths of 19 inches, locked widths of 38 inches, and available lengths including 10, 12 and 14 feet. Height ranges vary by length, and extend up to 40 inches. Additional features with our twin lock ramps include 15 degree grade angles, a 3 inch safety curb, 12 inch lip, shark tooth decking, and 2 inch maximum deflection under rated loads, all of which work together to ensure safe and smooth operation.